The Neopost IJ-70 automatic mail processing system is an excellent solution for mailing needs. The IJ-70 franking machine offers accurate postage fees and it can handle 200 departments for mail accounting. The Neopost IJ-70 postage meter is customisable to allow users to put in desired texts and images for franking. Aside from delivering high-quality envelope texts, this unit also has a built-in label dispenser. The integrated scale weighs are not standard to the unit. Measuring 33 x 11.5 x 18 inches, the Neopost IJ-70 inkjet printer is compact and features a handy and organised control panel with a monochrome LCD display and function buttons. The Neopost IJ-70 franking system has an autofeed for envelopes and has an impressive speed of 150 lpm. A direct modem connectivity is also offered for secure postage meter refills. The IJ-70 printer requires a red Neopost 300239 ink cartridge to print reliably. Offices can save a lot of money and time with the Neopost IJ-70 franking machine. This unit is accurate and delivers professional output. It even comes with a handy software and connectivity to PCs that can export reports and data. Aside from being quick, the Neopost IJ70 mailing system is also reliable and uses high-yield consumables. Users can make advertising dies as well as custom images, logos, and slogans with the Neopost IJ-70. The weighing scale for parcels is additional cost and the Neopost IJ-70 digital mailing machine is already a bit pricey itself. 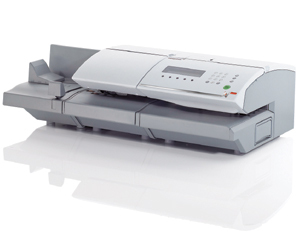 The IJ 70 is designed for mailing purposes only and can handle a limited number of media.